90 years raising dairy cows on the hills of Nicasio, the owners of the Lafranchi family dairy decided the time had come to try something different. "We used to go to Switzerland when I was growing up, and we always loved the cheese," said De Deterding, whose grandfather, Fredilino Lafranchi, founded the dairy in 1919. "My dad had always wanted to try cheesemaking, but he was never able to do it. But the dairy business has been difficult lately, and so about five years ago we said let's do it." The five Lafranchi siblings traveled to the Swiss village of Maggia to convince master cheesemaker Maurizio Lorenzetti to mentor them in making cheese. For the past four months, the family's Nicasio Valley Cheese Co. has found a growing clientele for its cheeses at local grocery stores, the Marin Farmers Market and an on-site creamery. "It's been wonderful how it's grown," said Deterding, passing out toothpicked samples of formagella and Nicasio Square cheese at the Civic Center Farmers Market. "People really seem to like it." The creamery's success couldn't have come at a better time for the Lafranchi dairy. Thanks to a precipitous drop in price, the value of Marin County's milk production - traditionally the county's premier farm product - fell by more than $13 million from 2008 to 2009, a 37.1 percent drop, according to the annual county agricultural report. "Last year was, without a doubt, the worst year on record in the dairy industry," said Dominic Grossi Novato dairy farmer and president of the Marin County Farm Bureau. "Most of the conventional dairies are on edge right now, not just in Marin or Sonoma, but in the whole state. Over 100 dairies went out of business in California last year, about 6 percent of the state's total." The crash in milk prices happened because a stronger dollar made American milk too expensive for European markets, said Leslie "Bees" Butler, a dairy economist at the University of California at Davis. "We ended up with 10 percent too much milk - and just 2 percent too much is enough to make prices crash," Butler said. "Another thing that happened is that prices for feed spiked up incredibly in 2008, due to the demand for biofuels. Producers got a double whammy: high-priced feed, and low prices for their milk." The plummeting price of milk - which comprises 42.4 percent of the county's overall agricultural production - is the main reason why the value of that production fell by 16.7 percent last year, from $63.3 million to $52.7 million. Yet those numbers belie the fact that other areas of agriculture continue to expand. The value of Marin's wine grape production rose by 11.3 percent in 2009, and the value of its aquaculture - fueled by the county's oyster farms - rose by 11.8 percent. Fruits, vegetables and other field crops grew by 13 percent in 2009. According to Marin County Agricultural Commissioner Stacy Carlsen, that growth has come about in part because farmers and ranchers are finding more places to sell their products - and more local demand for those goods. "The willingness for local markets to purchase those products and being able to sell them at local farmers' markets has been a boost to local producers," Carlsen said. "There's been a strong wave of community recognition that those who enjoy fresh, wholesome beef need look no further than the borders of our county." That local support has helped fuel a willingness in Marin's farmers to experiment. While the dollar value of cattle and calves fell by $846,258 from 2008 to 2009, and the value of sheep and lambs fell by $180,025, that of "miscellaneous" livestock - goats, hogs and rabbits - jumped from $83,850 to $315,468. "I was raised in a family that raised beef cattle, and I was looking for a way that I could be on the ranch, be a part of it and not hinder my parents' operation," said Judy Rossotti, a fourth-generation rancher. "Goats were the answer." 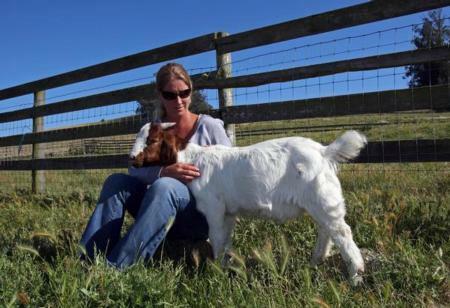 Rossotti now manages a herd of about 125 African Boer goats, which produce about 250 kid goats each year on her family's ranch in Point Reyes Station and a ranch she and her husband purchased in Northern Marin. Last fall, the Rossottis began selling goat meat - at an average of $8 to $9 a pound - at the Marin Farmers Market and online. "Here in the Bay Area, people have such a desire for healthy food," Rossotti said. "Goat meat is low in cholesterol, similar to chicken, though on the protein level it's similar to beef. And it's very, very lean, making it very healthy." Like Marin's cattle and sheep ranchers, the Rossottis are benefiting from a long, wet winter that's left Marin's pastures with the best covering of grass in recent memory, allowing ranchers to go longer without purchasing feed and lowering the overall cost of production. And while Rossotti's grass-fed goats aren't yet certified organic, many of Marin's dairies are - something that's helped them weather the financial storm. "Most (organic) producers survived quite nicely, because there was a much higher price for their milk and that price does not change monthly," Butler said. "Going organic, getting some goats or creating a little cheese plant - those really are the things that can stabilize the income of a dairy producer." Those options aren't available to every rancher, however. And while milk prices have begun to rise since last year, a continuing glut of milk means dairy farmers are unlikely to see a dramatic improvement in the year ahead. "This year we won't be losing as much, but I don't expect it to be profitable for conventional dairymen," Grossi said. "And I think 2011 will be worse again, with so many heifers calving on a national scale." Nevertheless, David Lewis believes there's cause for hope. "I think we're well poised, despite the downturn," said Lewis, director of the University of California Cooperative Extension in Novato. "We've learned to fill niches and capitalize on our opportunities - and we've had some really good opportunities. I want to remain optimistic."